Parish records – a gold mine of knowledge hidden in plain sight. Back in the early years of my genealogical research, I was slightly obsessed with going back in time as fast as possible. You can just imagine that it was causing problems. Now when I am older and wiser, I like reading parish registers for fun! I can just see you cringing or looking blankly thinking “Crazy”. Well, not as crazy as it might seem at first. I don’t read random books from a random parish (although I can see benefits of that). What I mean is reading not just entries relating to my ancestors. It all started from a stubborn need of finding my 2nd great grandmother entry of death. my 2nd great grandfather’s death entry – quite young. But I could not find her death although her son’s marriage entry gave information that his parents were dead. I thought “I am going to find you” no matter what! I started reading every entry in the parish register dated between her husband dying and her son’s marriage. I know that the information in the marriage record of parents being deceased could have been a lie for whatever reason, but I was leaving this option for later. I read through 3 years worth of data, and I surely found her! She remarried under her maiden name! Knowing about the marriage, it was easy to find the death entry. I was able to finally put all the pieces together, but there was an unexpected bonus of being stubborn. I learned that my 3rd great grandfather from a different branch of my family tree was a village chief. Most of the descriptive Polish records has witnesses of any vital event noted. Sometimes those witnesses are random neighbours, sometimes family members and sometimes village officials. There is more to records that just dates and names. I can find a lot of useful information about my ancestors’ lives when I read entries from a few years. Sometimes I can say who was a village official at a certain time, who was close to whom, or what was the name of a blacksmith or a midwife. I know this because if a child was born illegitimate or to an absent father (for example dead before the birth or in an army what is an interesting fact per se) the birth was recorded by a midwife. So I know the names of midwives working in villages where my ancestors lived! All this because I like reading old parish registers like a documentary book. There is so much more in there than just names and dates. All you have to do is just pay attention and don’t rush through indexes. Take your time, immerse yourself into this long lost world. 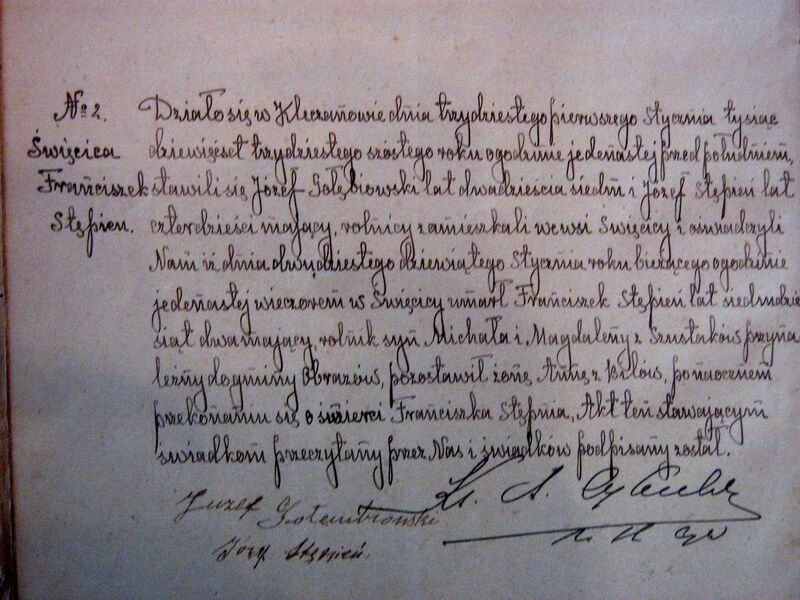 This entry was posted in English, sources and tagged family history records in Poland, parish records, polskie źródła genealogiczne on 24th February 2016 by Jolanta.